Prior to the UCI men’s basketball team’s season opener against UCSD, a banner ceremony was held to commemorate the team’s first NCAA tournament appearance last season. Hanging from the rafters, the banner served as a reminder of the team’s end goal for the season. Following the conclusion of the ceremony, the Anteaters wasted no time picking up where they left off last season, as they defeated UC San Diego, 89-73, in front of a home crowd of 29,629. Five different ‘Eaters were in double figures on the night, with junior center Mamadou Ndiaye leading the way with 16 points to go along with six rebounds and six blocks. Junior guard Luke Nelson, junior center Ioannis Dimakopoulos and redshirt freshman Jonathan Galloway all contributed with 10 points to help UCI garner an efficient 62 percent shooting average. The ‘Eaters came out the gate strong as they opened up with a 7-0 run in the first half until the Tritons stopped the bleeding with a shot beyond the arc. 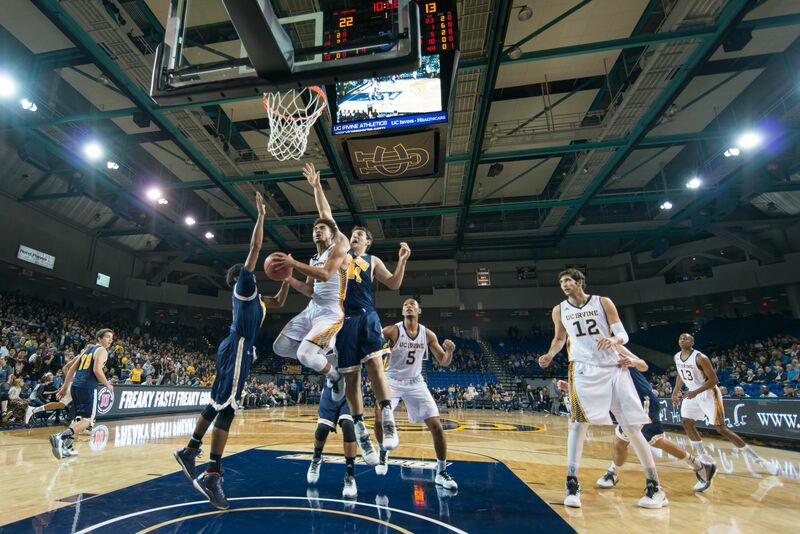 The Tritons’ ability to shoot from the perimeter caused the ‘Eaters to play their patented zone to guard the perimeter, with Ndiaye patrolling the paint. Irvine’s defense kept the Tritons shooting an abysmal 32 percent from the field and 29 percent from deep in the first half. Junior guard Jaron Martin proved to be an instant spark off the bench for the ‘Eaters, as he led all scorers in the first half with nine points. It was their effort on offense and their efficient 58 percent shooting in the first half that gave the ‘Eaters the 46-26 lead heading into the second half of play. It was a tale of two halves as the ’Eaters came out stagnant defensively in the second half, giving up six threes to the Tritons. Junior guard Aleks Lipovic led the Titans in scoring with 16 points, with four of his shots coming from deep. The Tritons shot 60 percent from beyond the arc in the second half against the ‘Eaters’ second unit and cut the lead to as close as 12 with 3:50 left in the game. To reel off the win, the ‘Eaters had to depend heavily on their presence inside the paint to preserve their double-digit lead. After hosting LMU, UCI will travel to Orlando on Wednesday to face the University of Central Florida, where 7’6” freshman Tacko Fall will match up against Ndiaye in a clash of the giants. The game will be aired on ESPN3 at 4:00 p.m.